All D3 CMTS series from Jinghong are developed based on DOCSIS3.0 and C-DOCSIS protocols. There are kinds of product types such as rack mount, outdoor and D-node. D3 series adopt channel binding technology, for downstream (DS), there are 16 QAM channels which has 1.1Gbps data rate; for upstream, there are 4 QPSK/QAM channels which could reach up to 160Mbps. 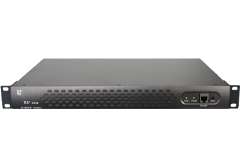 D3’s downstream can be configured to data channels or IP QAM channel. For data port, there are GE port (RJ45) and GE optical port (SFP). With layer 3 routing function and perfect QoS, they can meet all kinds of working conditions and requirements from different operators. Due to D3’s high bandwidth, perfect QoS, it is very suitable for IPTV or VOD, such kind of video service. It is cost effective for cut down cost then, add value for traditional HFC network. ◆External NMS server based on SNMP protocols which run windows OS. D3 series can compatible with DOCSIS3.0/2.0 cable modem. JH-HE3416 is one of a chassis CMTS with 19 inch 1U standard chassis, it is tailor made for head end room deployment. It is suitable for small broadband user’s scaled network. It has wide coverage and high efficiency. ◆Compatible with DOCSIS3.0, C-DOCSIS standard，work with all cable modem based on DOCSIS, support both EURO DOCSIS and DOCSIS. ◆16 DS channels bound, 64/256/1024QAM modulation mode optional. Data rate could reach up to 1.1Gbps@1024QAM. ◆4USchannels bound, could be configured to QPSK, 3-8 grade QAM mode, data rate could reach up to 160Mbps. ◆Flexible on channels bound quantity set for operators convenient planning and use of channel resource. ◆Layer 3 routing functions, support static route, VLAN and DHCP relay agent. ◆There are GE RJ45 port and SFP on WAN port, convenient and flexible. ◆Embedded DHCP/TFTP server, support PPPoE. ◆Load balancing based on quantity of CM either DS or US. ◆QoS based on service flow ensures bandwidth needs for various services. ◆Ensure network transmit safety via various kinds of methods such as BPI+, CM identification, anti-DOS attack , user isolation and IP source checking. ◆Support three management ways: CLI after log in via serial port or by telnet; Remote log in embed web NMS; External NMS server based on SNMP protocols which run windows OS. ▶One CMTS for one optical transmitter, the downstream frequncy can be used repeatedly. ▶Superior coverage capacity 1000 users commonly. ▶1.1Gbps bandwidth for IPTV, VOD services, meets NGB requirement. ▶Increase bandwidth by adding CMTS. ▶There is no more fiber on optical node for 1550nm fiber transport network. ▶RFoG workstation can finish transmission between US and DS by only one core fiber. ▶Greatly reduced the funnel noise. 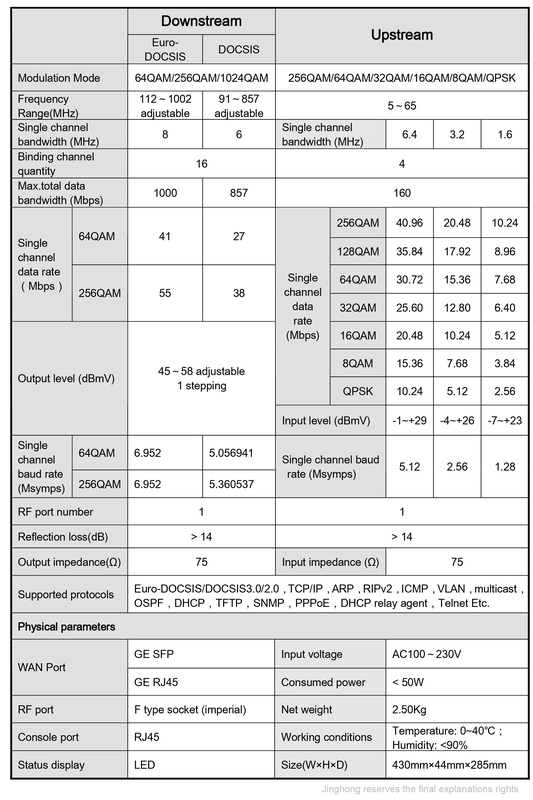 ▶1.1Gbps bandwidth could meet the NGB requirement. ▶CMTS upstream channel choose mixed input port, the circuit is simple and clear. ▶HFC system fits for second optical transmission. ▶The Downstream channel resource from different rooms can be used repeatedly. ▶1.1Gbps bandwidth, support IPTV VOD, such kind of video services.